Indulge in relaxation as Sublime Salon & Spa's professional estheticians revive and restore balance to your skin with one of our unique, revitalizing facials. Sublime's luxurious skincare treatments cater to all skin types and leave the face feeling beautifully rejuvenated. We are proud to specialize in the exclusive SkinCeuticals skin care line, providing advanced skin care packed with pharmaceutical grade ingredients. All first-time facial services begin with an analysis of the skin to determine a customized regimen that will utilize specific products that are made to work in synergy with one another to address any of your individual skin concerns. Our professionally trained skin care experts will recommend both in-spa treatments and a home-care regimen that will give you the healthy, beautiful, younger looking skin that you deserve! SKINCEUTICALS: A focus on preventive care, powerful antioxidant compounds, and high-potency formulas makes SkinCeuticals one of the most recommended cosmeceutical brands by dermatologists, medi-spas, and skin care experts. Originally developed by dermatologists and scientists researching sun and free radical damage, the SkinCeuticals line includes serums, sun protection, masks, and defense treatments. Research and innovation are at the core of the SkinCeuticals mission, and their dedication to science has established the brand as a leader in the advanced skin care arena. The company's founding was the direct result of a revolutionary discovery that set the standard for antioxidant formulation for the entire industry. With four generations of topical antioxidant formulations, 10 patents, and more than 200 studies published in prestigious medical journals, SkinCeuticals is a trailblazer in antioxidant science. SkinCeuticals' philosophy is built on the principles of Prevent. Protect. Correct. Prevent future damage. Protect healthy skin. Correct previous damage. SkinCeuticals philosphy continues to pioneer next-generation products that will optimize the health and beauty of the skin and change the face of skin care for years to come. Your Skin care Specialist will create this luxurious treatment according to your individual skin care needs. You will enjoy deep pore cleansing, exfoliation, light extractions (if necessary), lymphatic drainage massage, and targeted hydration therapy. The Signature Facial will restore your skin to its natural state of balance. This is an excellent facial service for all skin types. The Hydrafacial is a non-invasive, multi-step treatment that provides immediate results and long term benefits without pain, irritation or downtime. The Hydrafacial combines the benefits of hydradermabrasion exfoliation, a chemical peel, and automated painless extractions with a targeted delivery of antioxidants, hyaluronic acid and peptide rich serums into one rejuvenating treatment that delivers real results you can see immediately. This treatment includes a Deep Cleanse & Exfoliation, Glycolic Peel, Extraction, Hydration, and Antioxidant infusion protection. Booster serums for targeting problem areas can be added. Our tightening and toning Anti-Aging Facial targets fine lines and deep wrinkles to smooth and restructure skin to reveal vibrant, younger looking skin. Customized treatment includes a gentle and deep pore cleanse along with a specialized exfoliation to remove dead skins cells which are contributing to dull tired looking skin. A blend of potent antioxidant masks and specially formulated hydrators enhance the skin's own repair mechanism, stimulate natural skin renewal by boosting the collagen production to dramatically improve the skin's tone, texture and appearance. Ideal for a wide range of skin types, an Alpha Beta Peel treatment gently exfoliates by detaching the top layer of dead skin cells, then provides nutrients to the renewed healthy skin below. A combination of both alpha and beta hydroxyl acids will minimize the appearance of surface lines and smooth rough skin texture. It also aids in clearing acne, fading hyper pigmentation, reducing redness and boosting skin’s radiance. With our busy lifestyles, who has time for a facial? When you are short on time and long on lists of things to do, take a few minutes for yourself! 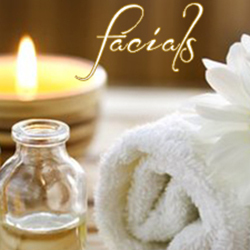 Our Express Facial is designed for the client on the go to deliver maximum benefits in a minimal amount of time. Includes deep pore cleansing, exfoliation, massage and hydration to refresh, renew and revitalize the skin in record time. Good for all skin types. Our Teen / Acne Facial is a great way to start good skincare habits and address concerns specific to teenage skin. Special anti-acne formulations rescue clogged pores congested with impurities. Deep pore cleansing, targeted extraction, and application of an ultra-purifying mask are designed to aid in the removal of blackheads and whiteheads while soothing redness and inflammation. Ultimately, skin breakouts are reduced and an improvement in skin clarity is achieved. Recommended for girls and boys. Uniquely designed just for the guys, our Men's Facial will ease razor irritation and help prevent ingrown hairs. Our deep pore cleansing will remove impurities and help prevent acne breakouts. Toning and hydration products will renew and restore skin tone and texture to reveal younger, healthier skin. Face, neck and shoulder massage will destress, relax and revitalize you.